Maybe “Props from BioShock 2″ would have been a more appropriate headline, but in any case, just in time for the release of the sequel to 2k Games‘ hit BioShock, NECA is proud to unveil two brand new, game-accurate props born out of the surreal world of BioShock 2! First up is the EVE Hypo, also known as the syringe full of crazy blue liquid that you can find all over Rapture and fully restore your EVE capacity. Our replica has LED lights that come on when you press the button at the top of the syringe and is over 8″ tall. It comes in window box packaging so you can see right away all the detail and weathering, just like in the game. 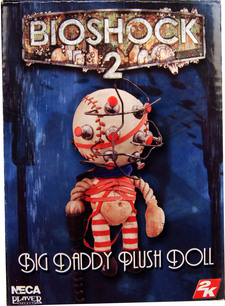 Next and no less awesome is the Big Daddy Bouncer Plush Doll. It comes with a rotocast plastic head and is an exact replica of the doll Little Sister carries around Rapture in the previews for BioShock 2. There’s the baseball head, wire frame cage, corkscrew arm and more. It stands almost 7″ tall. BioShock 2 is out Feb. 9, 2010. The EVE Hypo and Big Daddy Bouncer Plush are available now in stores and also at our Amazon storefront . Keep it tuned to necaonline.com for more info on BioShock 2 and other lines from your favorite games and movies.